When it comes to finishing steel building walls, most consumers choose long-lasting and durable exterior metal siding panels for their pre-engineered steel buildings. Although commercial steel buildings can be finished in other building materials for a distinctive appearance, most buyers still opt for metal building panels for the most weather resistant siding. A far cry from the old “tin” sheet-metal building siding options of your grandpa’s day, the strong metal building panels used on modern pre-engineered steel buildings provide durable protection and lasting beauty for decades. RHINO Steel Buildings offers the highest quality weather-resistant siding on the market. RHINO’s steel building walls include 26-gauge steel purlin bearing rib (PBR) panels, which install quickly and easily. To safeguard the steel, Galvalume® coats each metal siding panel. An aluminum and zinc alloy, Galvalume® assures maximum protection from rust and corrosion, keeping your steel building walls intact year after year. Your choice of color is baked over the Galvalume® coating, doubling the protection of the metal building panels. 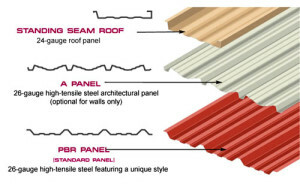 Available in eight vibrant hues, the color-coated PBR panels boast a 30-year guarantee and come in a variety of metal building colors. PBR wall and roof panels attach easily to the steel framing with self-drilling screws. The cast zinc aluminum screws include a durable, weather-resistant EPDM washer for a watertight seal. Manufactured to resist rust, ultraviolet damage, or ozone-induced deterioration, the screws and washers promise years of trouble-free maintenance for your metal building panels. 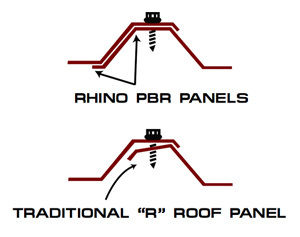 Unlike many of our competitors, RHINO’s PBR steel roof panels overlap the adjoining panel fully, providing an extra 1-1/4” of steel contact. This creates a stronger, more leak-resistant connection than old-fashioned “R” panels. Builders in coastal regions with salt spray — and areas with a corrosive environment or acid rain — should select metal building panels with a Kynar® -coated silicon, polyester, and resin finish for more weather resistant siding. If preferred, customers may choose 26-gauge “A” panel (for exterior walls only) as an option for their metal siding panels. The thicker 24-gauge standing seam roof panel represents the ultimate in weather-resistant siding. Standing seam sheets eliminate the need to penetrate the steel panel with screws, keeping your steel building walls even more protected from the elements. According to the American Iron and Steel Institute, standing seam roof usage has risen to almost 50% in commercial and industrial construction. Steel exterior panels are just one part of the total RHINO-tough metal building system. Call us today at 940.383.9566 to find out more about our standard prefabricated steel building package and the array of available options for weather resistant siding and metal building panels. Share the post "Exterior Panels for Pre-engineered Steel Buildings"